Today we are steering a Prius. Last week we ran a Citroen C1 electric car. Tomorrow we will probably grab a Honda Insight, or maybe a Mini. We might even take the BMW or Audi for a spin. No, we haven’t won the lottery, nor are we lying on our tummies playing with toy cars. We’ve joined Zipcar, one of the UK’s biggest and fastest growing car-sharing clubs. There are a range of membership options, but we’ve gone for the basic light-use scheme. This costs £50 per year plus by-the-half-hour rental costs, which start at £3.95 per hour or £29 per day. Fuel, central London congestion charge, insurance, breakdown assistance and 60 miles per day are covered. There’s no monthly commitment with this package – you can use your membership as much or as little as you like. As with mobile phones, regular drivers who are happy to commit to one of several levels of use will find their per-use charges are lower. Zipcar started life in the US, where it operates in 26 states from Alabama to Wisconsin. In the UK, it is currently operating only in seven selected parts of London, where you will spot the firm’s vehicles nestling alongside residents’ cars in a variety of boroughs or varying levels of heel – from the swanky streets of Chelsea to the nether regions of Tower Hamlets. Incidentally, members can book and drive cars in any Zipcar location worldwide. To be eligible to join, you must be at least 19 years old and have a relatively blemish-free driving history. If you still have spots, boast a licence with more points than a compass and have an accident history like Mister Magoo, you may need to shop elsewhere. Having applied to join, and limboed under the DVLA checks, we received our Zipcard by post three days later. The Zipcard is a smart card that unlocks the cars when waved over a reader fixed inside the windscreen. First we have to book a car – which is easily done via the Zipcar web site. Once logged in members can search for cars by region or by model, and the available options will be displayed together with their rental rates and their distance from your current location – you can set different fixed addresses such as your workplace, home or favourite park bench. An outlay of £3.95 per hour or £29 per day gets you behind the wheel of a Honda Jazz, Honda Civic or Toyota Yaris. Upping the ante to £4.95 per hour or £45 per day gets you into a Honda Insight, Honda Civic Hybrid, Toyota Prius or VW Golf. Stretching to £5.95 or £55 bags you a very desirable Audi A3, BMW 116 or Mini Cooper, a practical Toyota Verso, or a dependable VW Passat Saloon. And finally pushing the boat out to £6.95 per hour or £65 per day will see you tootling around in a BMW 318, if you like that sort of thing. There are also two electric-car wildcards: £3.95 per hour rents a Citroen C1 electric car, converted by ECC, or a plug-in Prius, converted by Amberjac. As well as booking by wireless laptop, we found it very easy to book using a BlackBerry smartphone. No doubt it would be even simpler and more hip and happening to prod our way to a booking via an iPhone, only we don’t have an iPhone. Arrive on time and wave your card at the screen reader and the doors dutifully unlock. Take a moment to check for damage inside and out, as you would with any rented car, and report anything untoward via the phone hotline. 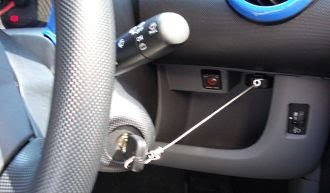 Then jump in and you’ll find the ignition key hanging from a retractable string fixed to the dashboard. Adjust the seat and mirrors, start the motor, and you’re off. Just keep an eye on the time – cars have to be returned to their starting point before your booking runs out, or punishing fines will ensue. After all, running late may ruin the plans of another member who has booked the car to transport a kidney to a hospital or something. If you do find yourself stuck in traffic miles from your parking bay with the clock ticking loudly, it’s a good idea to find a safe place to get on the phone and ask nicely if you can book for an extra half hour. Having taken one of the cars for a spin, we chatted to Paul McLoughlin, Zipcar’s general manager in the UK and Europe. We were most worried about what happens if a Zipcar is bashed by a third party while sitting empty between rentals. If we were the last to drive the car, would we get the blame (and have to cough up the insurance excess, which starts at £500 and goes down only if you pay for a waiver)? We’re not 100 per cent reassured by this, so we’d be interested to hear from any readers who have war stories to tell – good or bad – about their own experiences with damage to car club vehicles. According to McLoughlin, Zipcars lead busy lives. “Average utilisation is over 45 per cent - that means nine to ten hours of use per day, and two to three reservations per day,” he says. Each car does about 20,000 miles per year, and those are hard miles, mostly at low speed on urban roads. Small wonder that Zipcar favours brands with a record of reliability. “About 95 percent of journeys cover less than 25 miles and last less than four hours,” McLoughlin adds. But there is a green tinge to all this motoring - around forty per cent of members give up owning their own car after they join, according to McLoughlin. A case in point is Zipcar’s contract with the London Borough of Westminster. Its objective is to have 400 club cars on its streets by 2012, and to have 20,000 club members within its boundaries. It wants to reduce resident permit numbers by seven to eight thousand during this time, because each club car can potentially replace multiple private cars. And why this level of enthusiasm from a local authority? “At the moment, there are more resident parking permits than there are parking places in the borough,” McLoughlin explains. This tends to support the urban tale that most of London’s congestion is simply composed of drivers looking for somewhere to park, burning petrol and clocking up miles looking for a space that isn’t there. So we are quite enthused by the idea of all this sharing – fewer cars, used more fully, are better in terms of environmental impact than lots of rarely-used cars. It also helps that 20 per cent of Zipcar’s fleet are hybrids. McLoughlin emphasises that the current 350-car London fleet is just the start. Predictions from the Economist Intelligence Unit suggest there will be 5,000 club cars and 250,000 car-club members in London by 2012.